A big thank you to Nicola Goddard for her tremendous work in creating the following lesson plan, to help Korean children learn about the bear bile issue and to give them a chance to have their voices heard. 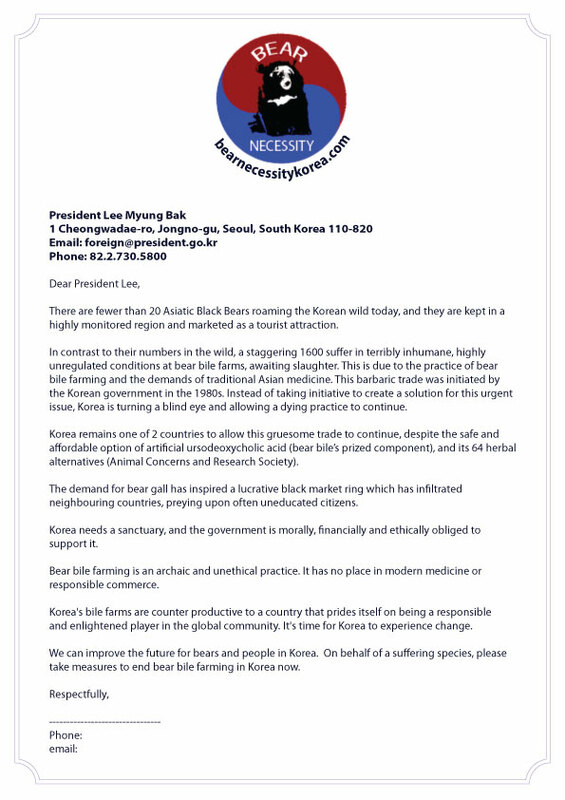 Nicola also arranged for her class to write letters to President Lee Myung Bak, urging him to put a stop to bear farming. Great work Nic, we feel fortunate to have your support! With enough public pressure, it is possible that the authorities will prioritize the formation of a solution. 1. Put pressure on the Korean government. Write letters! If you haven’t signed the petition hosted by our cherished friends at moonbears.org, please do so!